Glad to be back into the blogging swing of things. 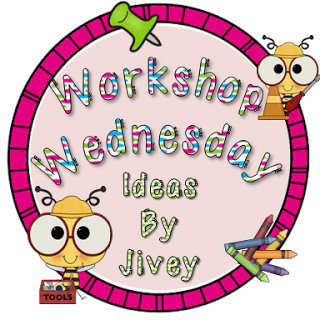 I'm even more excited to share some of my workshop organization today thanks to Jivey's Workshop Wednesday linky! Such a great place to find Reading, Writing, and Math Workshop ideas. We are still in our launching phrase of Reading and Writing Workshop. We're using poetry to launch our workshop and interactive notebooks. Last year, we had some issues on our team with students losing or missing supplies... so I knew storing notebooks had to be built into my workshop routine. First, I used some "pinspiration" to create my interactive notebooks storage area. Here is a peek into one table's organizational set-up. Each table has one double-decker crate. The crates are stackable milkcrates. Inside are magazine holders from the Target One Spot last spring. First "floor" is my morning class's Readers' and Writers' notebooks. Each magazine holder has a label so that students can easily grab and pass out the notebooks that are needed. All supplies students need for Reading or Writing Workshop are also at the table in each caddy. To organize book club choices and keep students moving through books in Reader's Workshop, I've labeled small stacking baskets from Target for book club novels. I'm hoping that having three baskets and sorting books by level will encourage "Just Right" choices. These hot pink baskets were a cartwheel and very sturdy for around $2.99! For Writing Workshop, I stuck with one central writing area for my students. Students have access to colored pens, a pencil sharpener, editing wheels, self-revision guides (editing and revision posters shrunk down to create mini-books), grammar handouts, and whole class journals! This area is perfect for students who finish early or need to move to the next step in workshop! This is the "Writing Depot"
Writing posters on the next cabinet for studnets that need "Fix-Up" Strategies. These include my ARMS and CUPS posters. I don't have a lot of station supplies. All my extra "stuff" for Workshop is housed under the counter in some three drawer carts from Target. Those are for teachers only, however. What organizational strategies do you use to keep your students on track? I love how you have organized everything, Amanda! It looks great! Are your book club choices for book clubs? Do students place books in there and then later you might choose them for book clubs? Everything looks super organized! I love how you have the revision checklists in your Writing Depot. I pinned that pic for some inspiration. Thank you!